Artificial islands, Dubai, United Arab Emirates. Photograph: © SAF — Coastal Care. “Sand is the second most consumed natural resource, after water. The construction-building industry is by far the largest consumer of this finite resource. The traditional building of one average-sized house requires 200 tons of sand; a hospital requires 3,000 tons of sand; each kilometer of highway built requires 30,000 tons of sand… A nuclear plant, a staggering 12 million tons of sand…” Captions by: “Sand Wars” Multi Award-Winning Filmmaker Denis Delestrac (©-2013). Four kilometers off the Dubai coastline lies Europe. Or a version of it, at least. To expand the possibilities for beachfront development, Dubai undertook a massive and controversial engineering project to create hundreds of artificial islands along its Persian Gulf coastline. Built from sand dredged from the sea floor, the islands are shaped in recognizable forms such as palm trees. 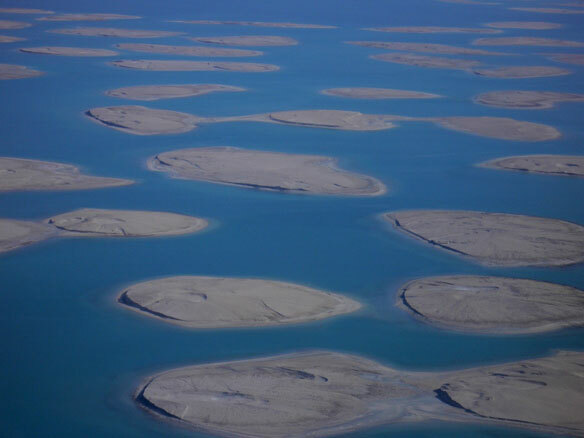 The construction of the various islands off the coast of Dubai has resulted in changes in area wildlife, coastal erosion and alongshore sediment transport, and wave patterns.